Looking at that Photo of the ships....we may have made a Terrible oversight. We never considered that Shmi Skywalker could have siblings, or that she may have come from another world before we meet her on Tatooine. 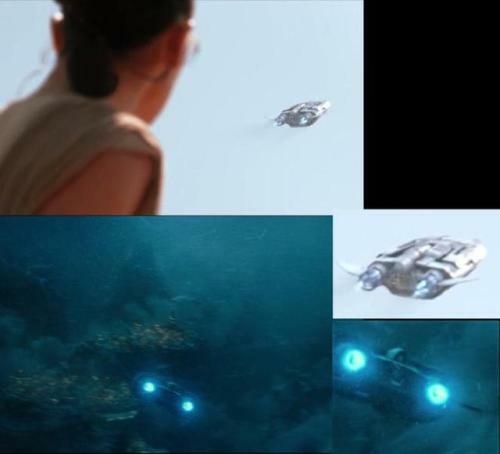 TFA had Kylo kill a 'Clan Leader' well what if that clan is called 'Skywalker' and Shmi was ONE of it's members. That shot of the hidden city on the mountain....that's where the Clan calls home, and they play a major role in the final film. Another potential oversight....what if Shimi lied about Anakin's conception? What if she raced off to Tatooine to escape a man she once loved but slowly discovered had turned to Darkness? A man named Palpatine? Hmmm... I'm more interested in the vessel in the above image. That looks like a shuttle, not a full blown ship. If so, wonder on the class, size, dimensions. Because that looks a lot better than most Star Wars Shuttles. Most look to my eyes horrible at being space and energy efficient auxillary or small craft.